Krispy Kreme was born in Winston-Salem, but its popularity — and the siren call of that glowing sign — has spread around the globe. EDITOR’S NOTE: This story was originally published in August 2016. Did you catch that? No local says, “Let’s go to the Krispy Kreme for a doughnut.” We say, “Let’s go to The Kreme” (referring to the location), or, more viscerally, “I need a Kreme” (referring to the glazed perfection available only there). It is, one must admit, a thoroughly North Carolinian expression of carpe diem. When I was a boy, equally enticing as the glazed pastry itself was the mesmerizing spectacle of how the doughnuts were manufactured. 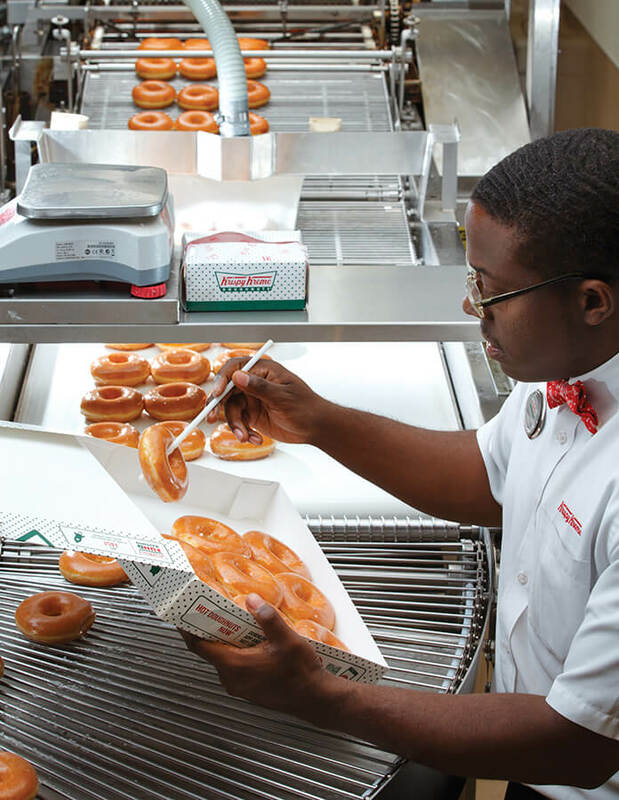 Not all Krispy Kreme outlets have the glass wall that allows you to see the doughnuts being made, but Winston’s did. I think of childhood outings when, clearly, whoever was minding us had run out of options and decided to take a mob of neighborhood kids to The Kreme. We would nudge and squeeze past one another for a good spot to observe, our faces pressed against the glass that separated us from a conveyor belt that fired my imagination as much as reading about Willy Wonka’s chocolate factory. In the 1990s, the Krispy Kreme corporation began a redesign of their doughnut shops, which were stuck (although, I insist, happily) in the 1950s. Gone were the flecked trapezoidal aquamarine Formica counters; gone was the sign that must have been a bane to the long-suffering waitresses: NO TIPPING. It was 1992 when they introduced the circular HOT DOUGHNUTS NOW sign and logo that we’re familiar with. 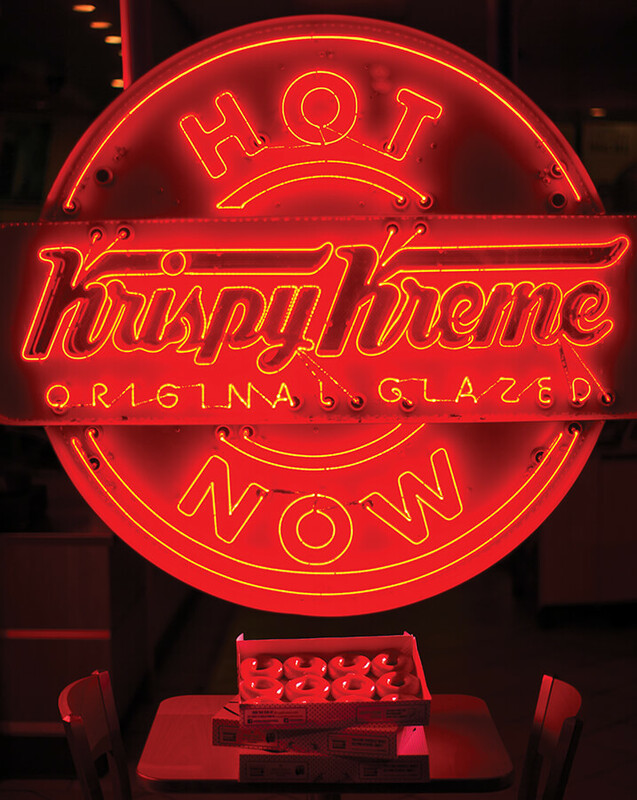 Who hasn’t driven by the HOT sign when it was glowing, calling, calling to you personally like a friend? The redesigners incorporated old photos into the wallpaper: black-and-white parking lots full of Packards and Ramblers, laughing faces of ladies with beehives and cat-eye glasses, gentlemen with military cuts, kids in their Sunday best. I’m fairly sure that one of those blissful kids, pictured with a kindergarten horde of other sugar-deranged children, was me. I say “was” because they’ve redecorated again, the photo is gone, and the family argument about whether that was me on a kindergarten field trip has come to an end. Stop looking at me like that. I can quit anytime I want. Back when I lived in Winston-Salem, I drove every day along Stratford Road, home of one of the original Krispy Kreme shops. I would live through the five phases of doughnut grief: Denial (“I don’t want one.”), Anger (“I never get to eat anything good!”), Bargaining (“After the day I’ve had, who would blame me for needing a little treat?”), Depression (“Guess I’ll never stick to my diet.”), and Acceptance (“I’ll start the diet tomorrow.”). But when I went to college in Michigan, months would go by without the hometown icon, and, somehow, I survived. Driving home for Christmas through the snow, coming down through Fancy Gap, Virginia, on U.S. 52, almost as heart-stirring as the silhouette of Pilot Mountain against a sky of stars was the red neon of my hometown Kreme on Stratford Road, waiting up for me, wondering where I’d been. I was eager to see my family, but they could wait five little minutes until I secured the first bite of a hot glazed doughnut that meant that this Southern refugee was back home again. For much of the 20th century, you acquired your hot glazed doughnuts down South. On my route north, Alexandria, Virginia, was the northeastern reach of the true Kreme habitat. I knew how to get off I-95, sidle over to U.S. 1, load up on boxes of Kremes that I’d promised to friends in Brooklyn, and hop back on the highway with no more than a half-hour sacrificed. There were some boreal Kreme franchises (Syracuse, New York; Scranton, Pennsylvania), but until the 1990s, beyond the Mason-Dixon Line lay the waste places, a tundra ceded to Dunkin’ Donuts and Tim Horton’s. Little Rock, Arkansas, was the last-chance doughnut for the pioneers headed west; Biloxi, Mississippi, was my southeastern outpost when headed to the Gulf. In that most Southern of cities, New Orleans, there was no Krispy Kreme franchise until the 1980s. Perhaps this was because the only rival on earth to the hot glazed doughnut resides there: golden-brown beignets covered in drifts of powdered sugar, served with coffee and chicory at the Café Du Monde. Important fact: Krispy Kreme founder Vernon Rudolph bought his recipe off a doughnut-maker in Louisiana, so the beignet and the hot glazed are, I suspect, first cousins. Now, Krispy Kreme is worldwide. On my way to visit friends in Oxford, England, I can grab a Kreme at Paddington Station. An Australian buddy sends reports of Krispy Kreme gorging taking place in Perth. 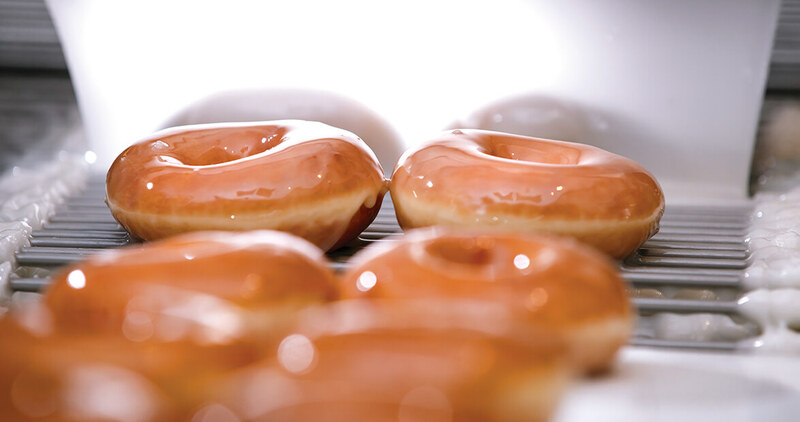 Now the hot glazed wonder has made its way to Bangalore, Beirut, Bahrain, Bogotá … and that’s just the B’s. It used to be our secret, but, I suppose, it’s better that we share. Wilton Barnhardt is a novelist and a creative writing professor in NC State's Master of Fine Arts program.